The Christmas season certainly is the most wonderful time of year. 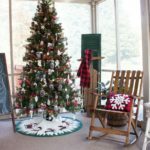 I love Christmas decor and today am sharing Christmas in my living room. 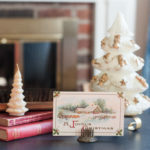 I love vintage and I’ve incorporated lots of my vintage things into this year’s Christmas decorations. 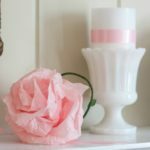 Yesterday I shared my vintage inspired porch decor and I invite you to join me on the porch after you’ve toured the living room. 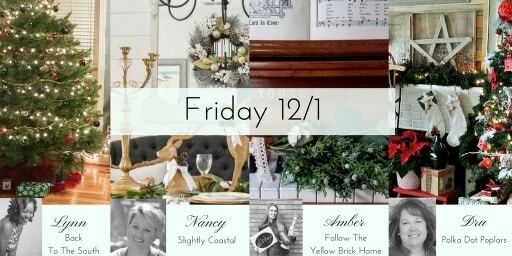 I’m Decking the Halls with Reinvented and 17 other home decor bloggers for a “It’s a Wonderful House” Christmas Home Tours. If you are here from Keys to Inspiration, welcome! I know you enjoyed touring Cristene’s lovely home and I’m happy to invite you into mine. 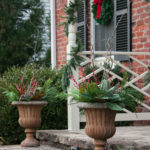 You’ll find links to the Christmas decorated homes of the participating bloggers at the end of this post. Come on into our living room so that I can show you around. Truthfully the family member who enjoys this room the most is our dog, Sherman. He spends most of his day in here napping, guarding the house, and waiting for his favorite human on Earth, my husband, to come home. This is the first time I’ve shared our living room since it got a new paint job. I spent many hours giving the windows, trim, and walls a new look. 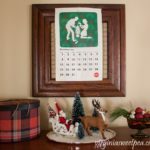 You can check out my Christmas Living Room post from last year to see the difference in paint colors. 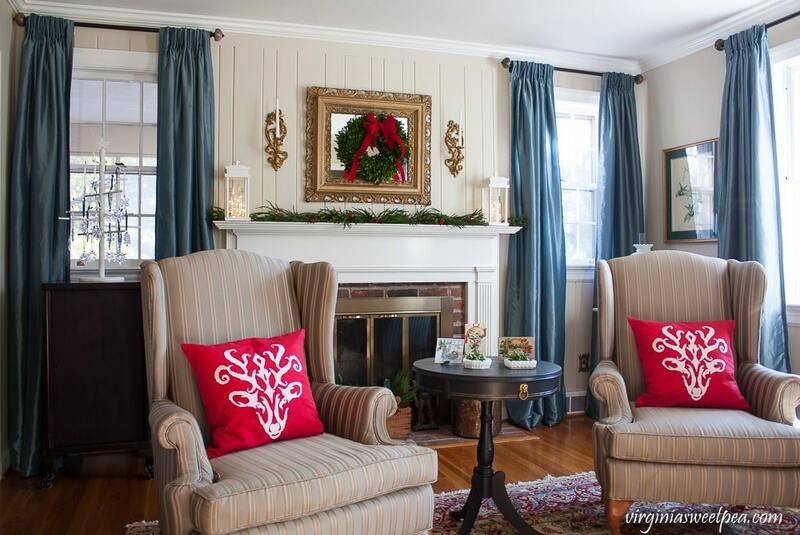 I’m thrilled with the colors I used, Clay Beige on the walls and White Dove on the trim, both from Benjamin Moore. 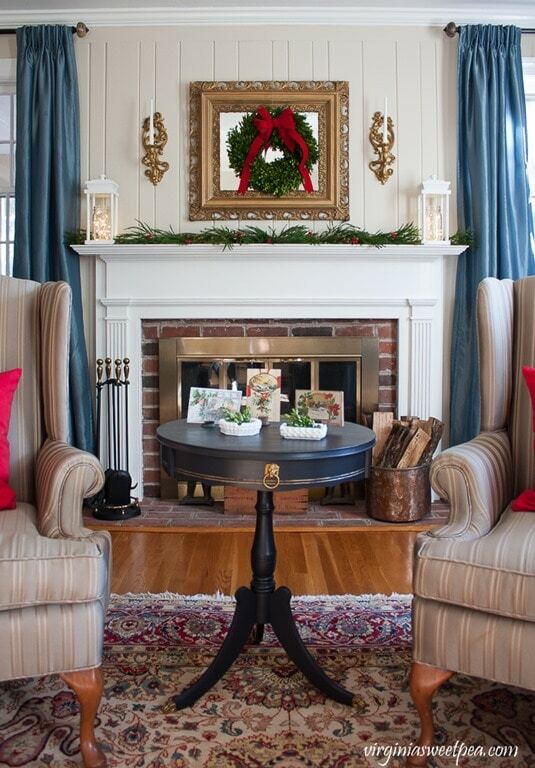 The mantel is the focal point of this room and also one of my favorite spots for seasonal decor. The antique gold mirror over the mantel was a recent find and I dressed it for Christmas with a boxwood wreath that I made using clippings from our yard. 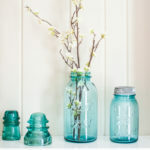 The lanterns are another DIY project and I will share a tutorial for making them on Thursday. The sconces beside the mirror were a Goodwill find and I’m thinking that perhaps I should switch out the candles from white to red for Christmas. 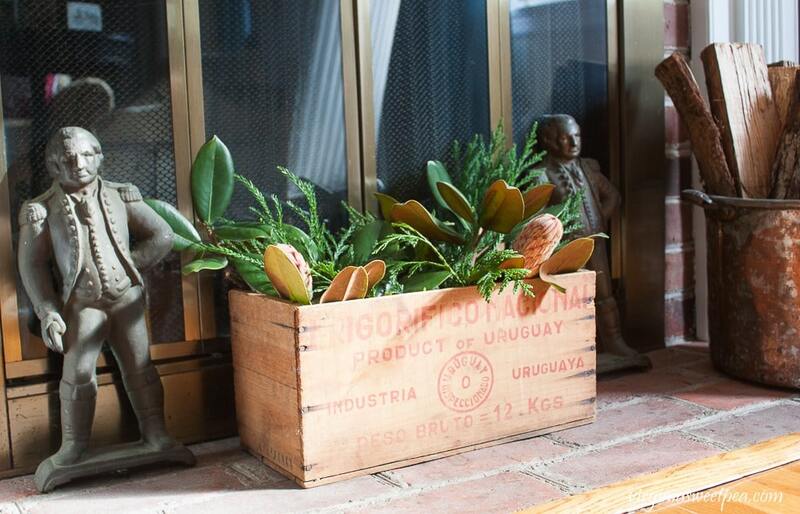 A vintage box in front of the fireplace holds more greens from our yard. The George Washington andirons are a recent antique shop purchase by my husband. 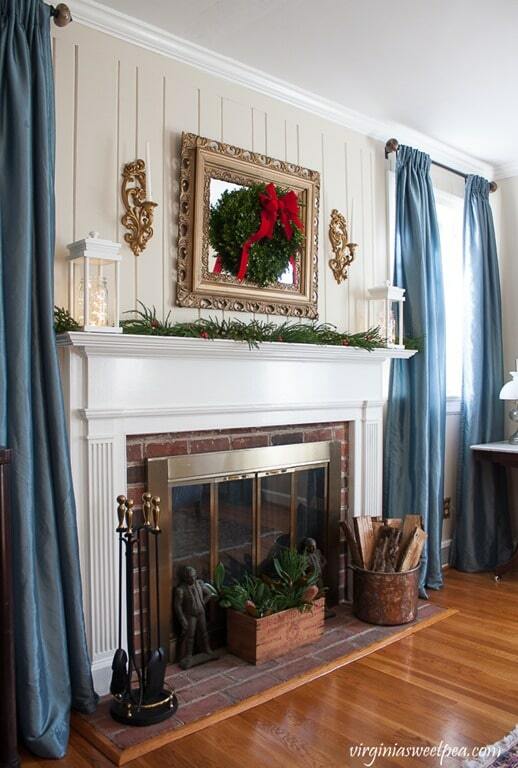 We are planning on removing the dated brass fire screen and adding gas logs to the fireplace. When we tackle that project, we’ll find someone to weld good old George to a new fire grate to use with our gas logs. When we were married in 1994, my husband started a tradition of giving me a Swarovski crystal snowflake ornament. Now that we’ve been married for 23 years, I have quite a collection. I display them on a wooden tree that we made together many years ago and leave them in this spot until March. The refracted light patterns that they make are incredibly pretty. Swarovski ornaments used to have blue ribbons but in recent years the ribbon color changed to white. The 2017 ornament did not disappoint! My husband ordered this year’s ornament ahead of time and was able to give it to me as I was placing the ornaments on the tree for this year’s display. Yes, he’s a keeper! The vintage drum table in front of the fireplace was gifted to me by my former teacher assistant. It belonged to her aunt and after her aunt passed away, she knew that I would like it and gave it to me. I gave it a makeover and have enjoyed it ever since. 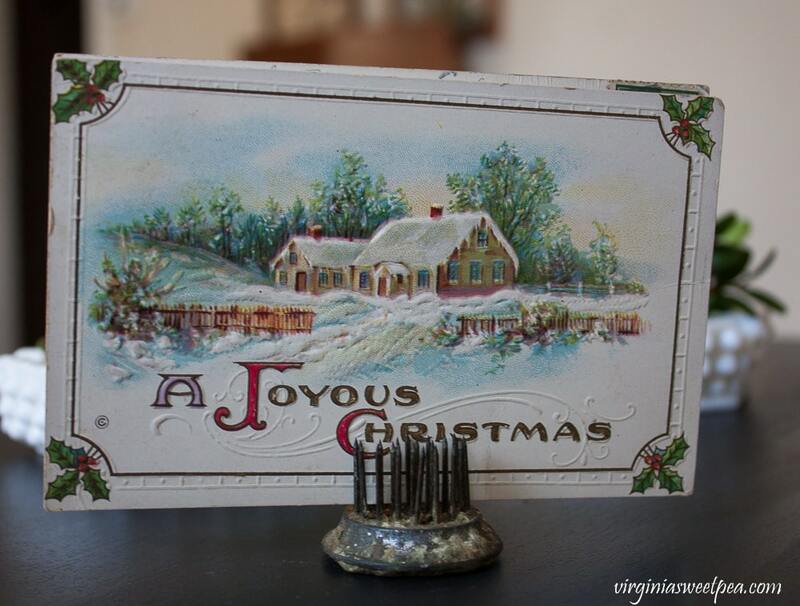 It holds a display of vintage Christmas post cards that belonged to my great aunt, all dated in the early 1900’s. 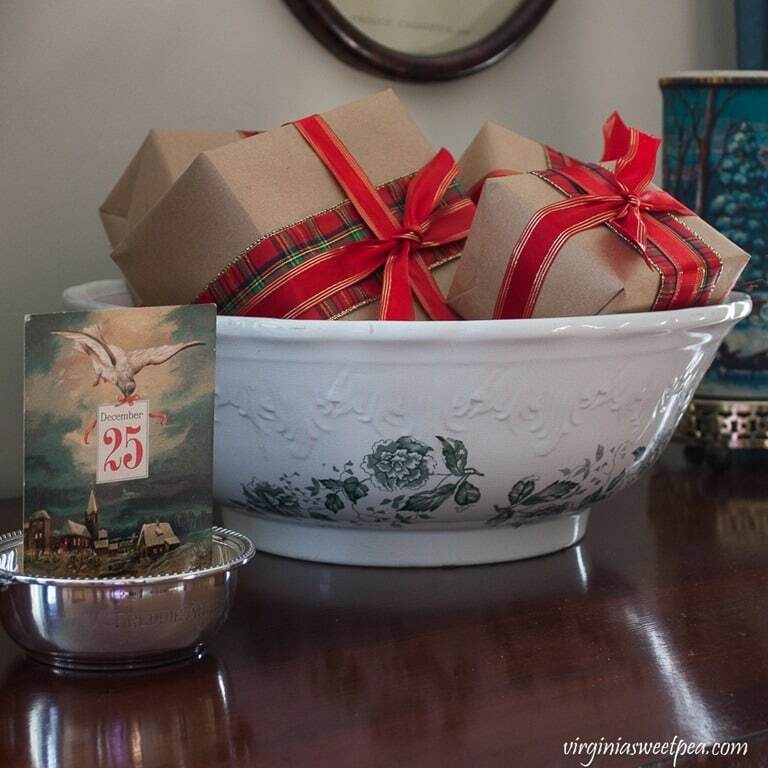 I found the milk glass ash trays a few years ago at a yard sale and couldn’t resist buying them. 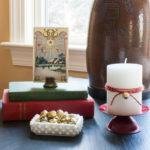 They are great for office supplies or on my dresser for holding loose change or jewelry. The graphics on vintage post cards are so pretty. My grandmother was a gardener and very talented at floral design. 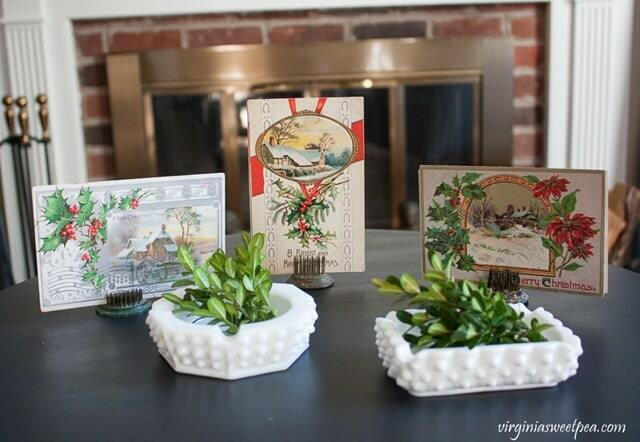 Her flower frogs are the perfect size to use for displaying post cards. I actually display two cards, back to back. If you view the room from the opposite side of the table, you enjoy a different card. When I pull these cards out this year, I inevitable spend more time than I intended admiring their art work and also reading each card. 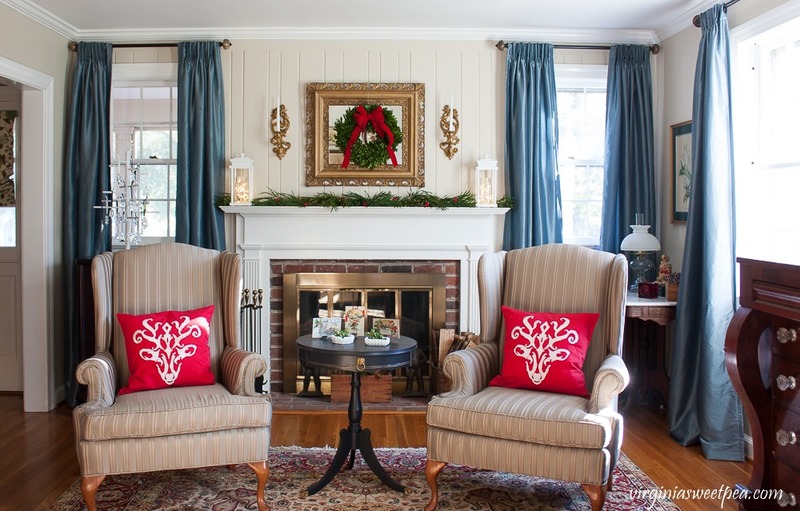 Red reindeer pillow covers brighten the wing chairs that flank the drum table. My mom got these at a church sale for $9. I had them reupholstered years ago and hope to soon make slipcovers for them. The chest to the right of the wing chairs belonged to my grandmother and is one of my favorite pieces of furniture. I was thrilled when my aunt let me have it when my grandmother had to move to a retirement home. 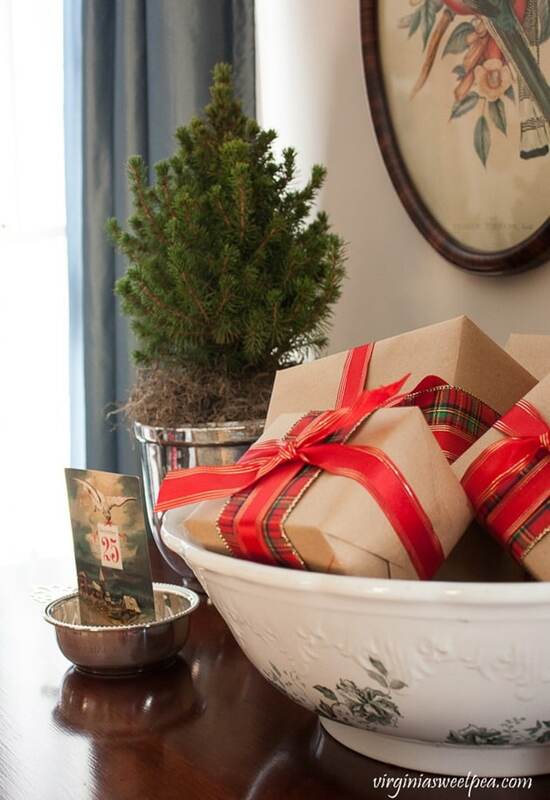 On the chest I displayed an Alberta Spruce tree planted in a vintage ice bucket, a bowl of gifts, another vintage post card and my 1957 Econolite. 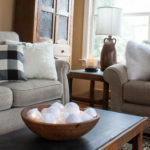 If you aren’t familiar with an Econolite, the heat from a light bulb in the center causes the interior to move which creates a snow effect in lights on the outer display. 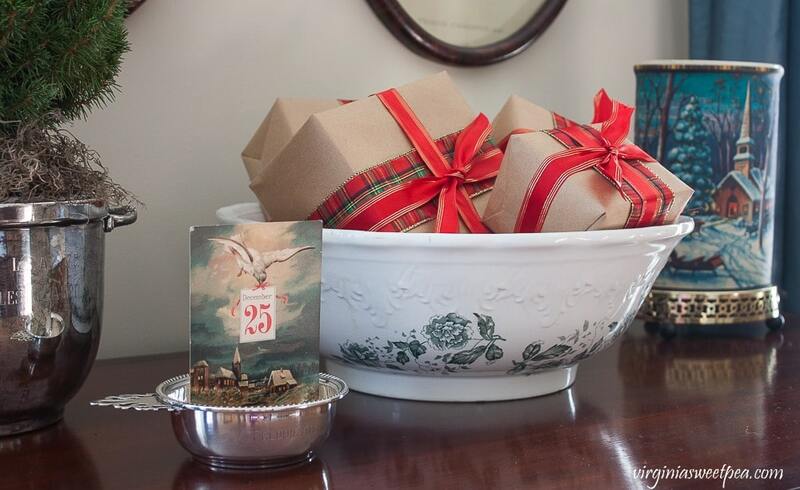 The silver bowl that holds the December 25 post card is engraved with my dad’s name. It was a gift to my grandfather from the 1941 William Byrd High School senior class. The students surprised my grandfather by having my grandmother and my dad at the assembly when it was presented to him. The bowl holding the gifts is a bowl and pitcher set that my mom gave me that I usually keep on an antique wash stand that I purchased with my first teacher paycheck. After Christmas is over, I hope to plant the Alberta Spruce in our yard. That is if I can remember to keep it watered. 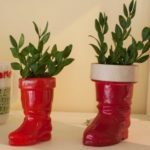 I like growing plants outside but I’m not so good at taking care of the indoor variety! Mama bought my Econolite for me at an antique show long ago. I leave this out all winter and try to remember to turn it on each night. I love vintage bird prints and have quite a few of them in my home. The pair hanging above the chest were found at an antique shop in Appomattox. To the left of the chest is a marble topped table that was my grandmother’s. 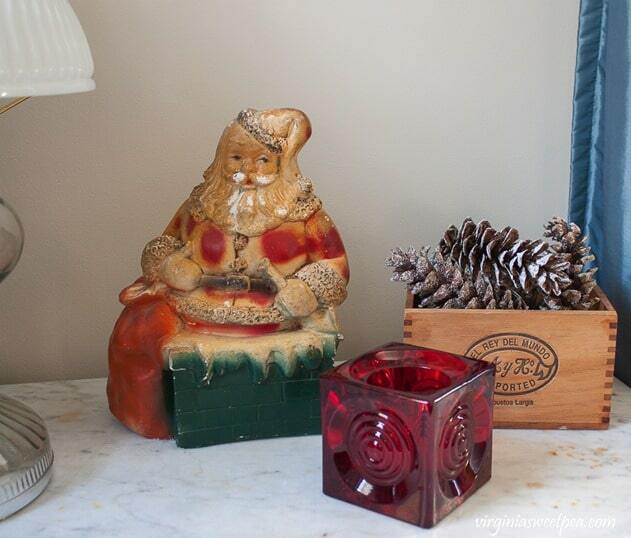 On it I have a vintage Santa bank, a vintage candle holder that was my grandmother’s and a wood box that I found in someone’s trash when I was running one morning. Sherman spends his day sleeping here or on “his” sofa. It’s funny how the sofa that no one ever used quickly became the dog’s sofa when our fur baby came into our lives nearly five years ago. The opposite wall houses my dad’s mid-1960’s Montgomery Ward stereo that still works. The sheet music above it belonged to a family member whose 1912 house my mom restored and now lives in. The box on top of the stereo is an old radio that was converted into a storage box. The lid has hinges and interior is lined with felt. My aunt gave this to me a few years ago. Our 1950’s Cape Cod has tiny closets, so I use it to store my winter hats and gloves. On the stereo I displayed a few vintage Christmas albums. I so much enjoyed giving you a tour of our Christmas room. 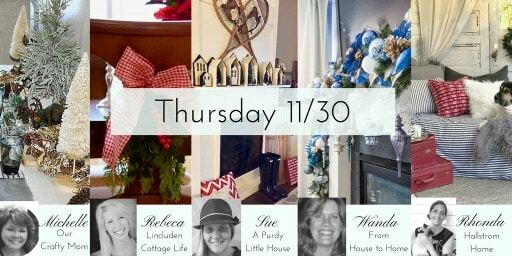 I’ll be sharing more of our home’s Christmas decor in the next few weeks. Next on today’s tour is Leanna from Fairies and Fauna. I know you will enjoy touring her lovely home. Now I invite you to check out the other bloggers’ Christmas homes. Come back each day this week to visit the bloggers on the rest of this week’s tour. I know I can’t wait to be inspired by what I see. Click on the links below to visit each home. Thank you, Kelly! 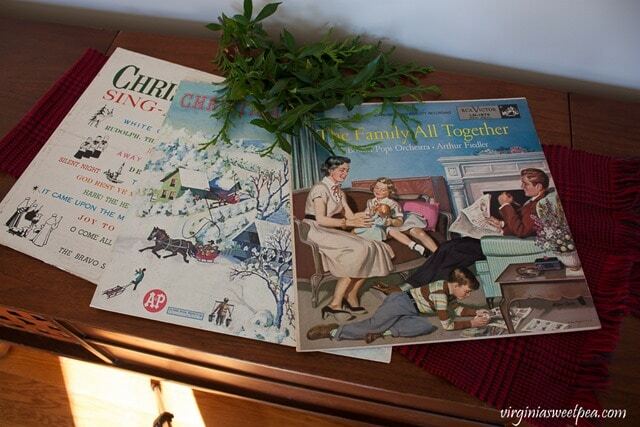 I’m lucky to have so many vintage things that I can use at Christmas. Your home is so beautiful!!! I love all the details and everything that you have put into this space. It’s so pretty! Thank you so much, Cristene! I had fun decorating it and am already enjoying it so much. Your living room is BEAUTIFUL! 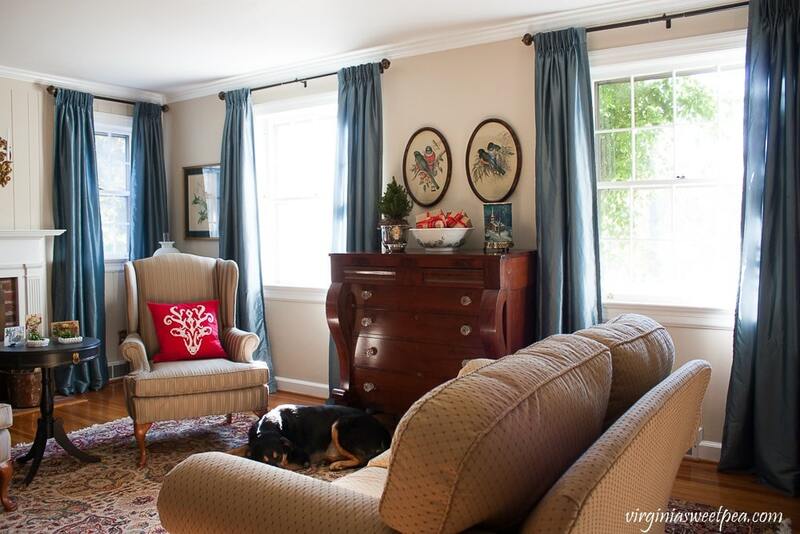 I really like the new paint colors and the mix of vintage pieces. 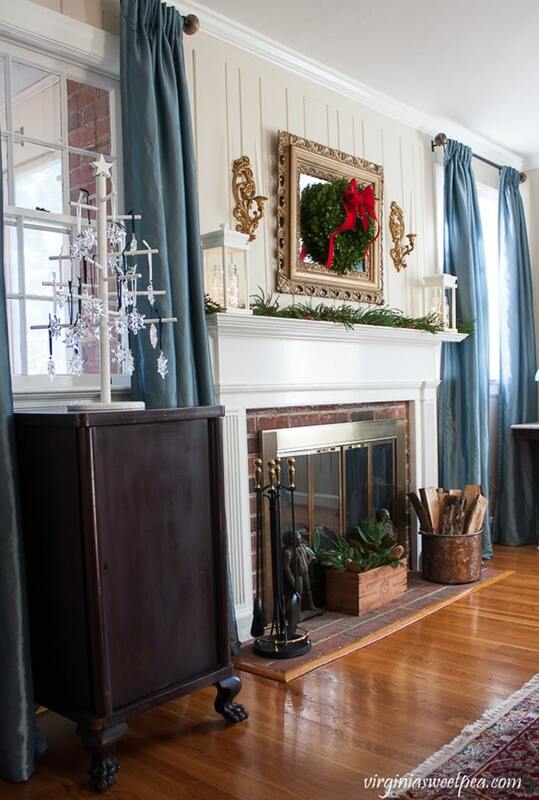 That stereo cabinet is so cool and I like the decor on the mantel, especially the sconces that were a Goodwill find. You really found a lot of fun ways to display your Christmas pieces and your husband picked out a beautiful snowflake this year! Thank you, Karla! I am so much enjoying this room now that it has a refreshed look. It’s amazing what a little paint can do for a space. I enjoyed the tour of your living room! My eye was immediately drawn to the vintage bird prints. I have several as well, and they always catch my eye. Thanks for the tour! Thank you, Joyce! I love those bird prints and am glad that I found them years ago. It’s funny, I don’t care much for watching birds in the wild, but I love prints of them. Oh how sweet! I love all your beautiful vintage decor! There is nothing better than an old fashion Christmas! I adore all your treasures! ??? Thank you so much, Rebeca. I am lucky to have inherited so many vintage treasures. I’m looking forward to seeing your home later this week! 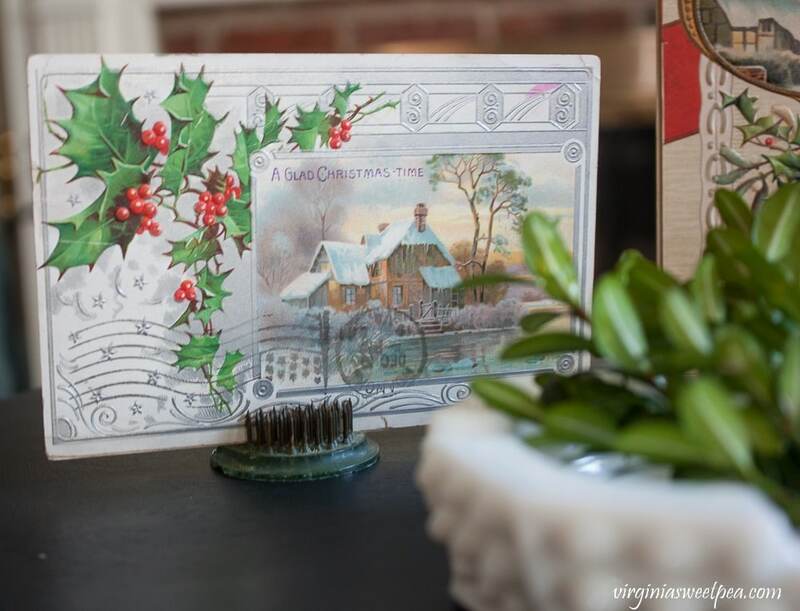 I love your vintage Christmas postcards and Christmas albums – so cute! I also adore your Swarovski ornament tree. 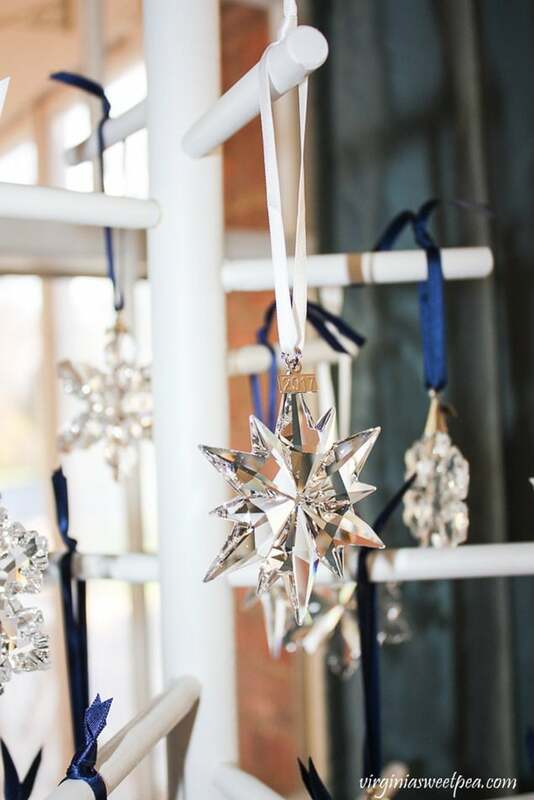 I am sure that it just sparkles and shimmers in the light – I would leave it up too! I have to say I prefer the blue ribbon to the new white ribbon, but I suppose the white ribbon goes with more, right? 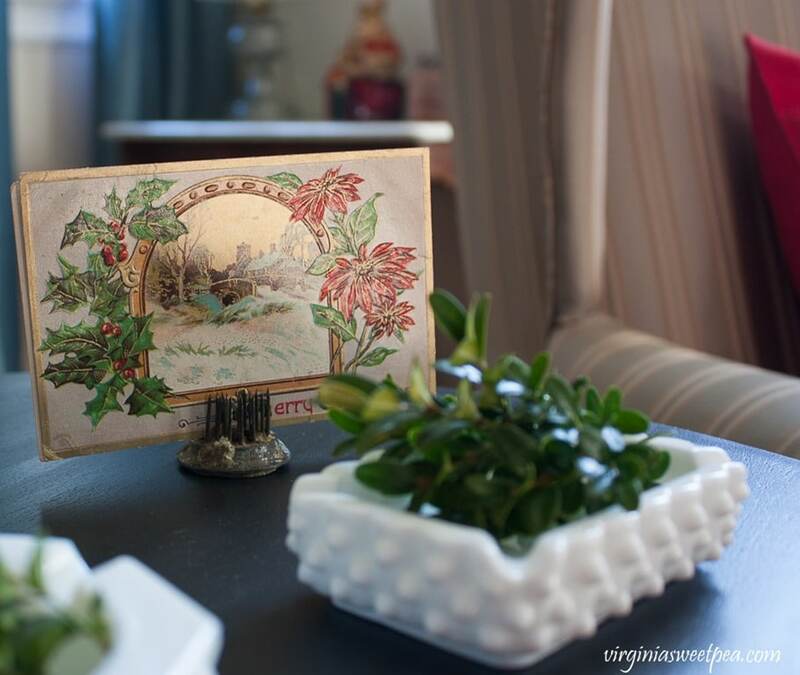 Your vintage decor is not only beautiful but full of memories. I really enjoyed reading about the history of the different items. 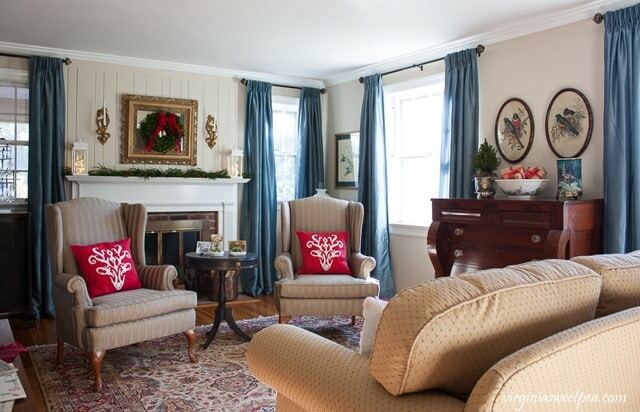 I love how those tall blue curtains ground your room and contrast the red cushions. Lovely home to tour. I love all the vintage styling and amazing collections you have. 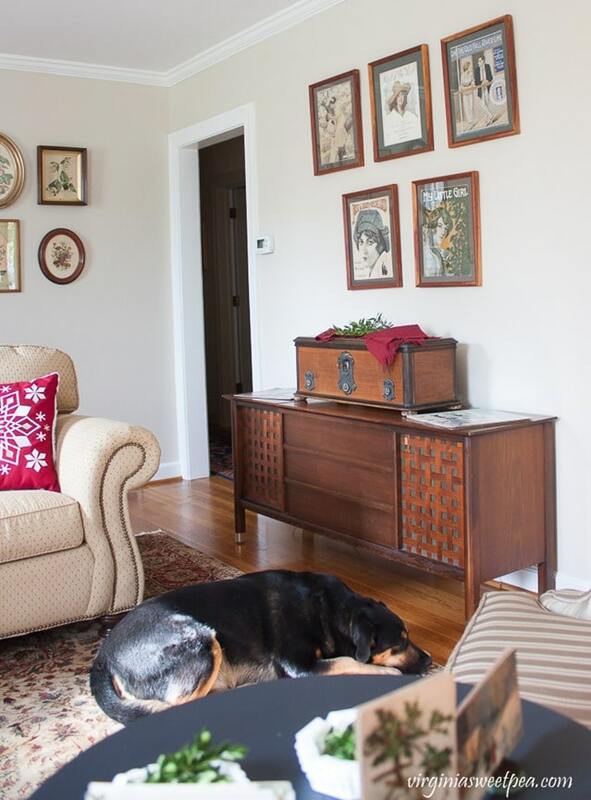 What a fabulous space and your puppy is adorable too! Thank you for sharing. 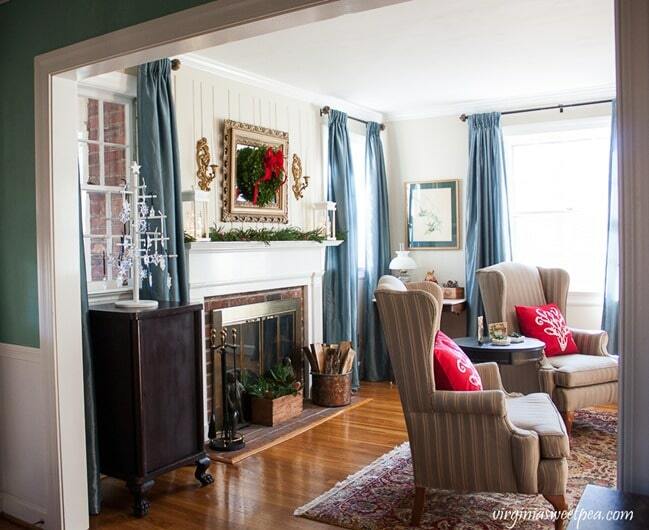 Hi Paula…your living room is beautiful! 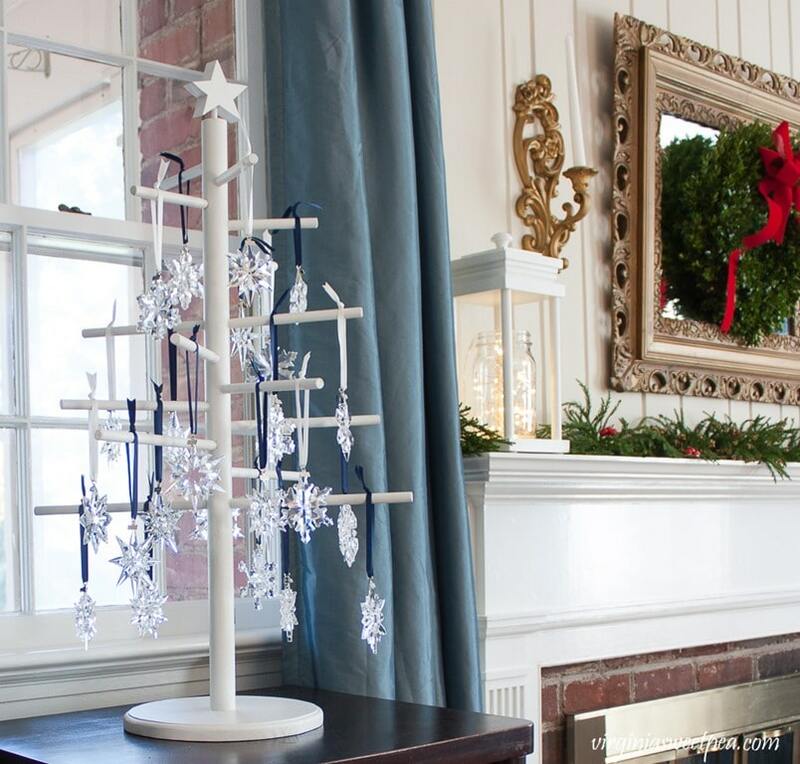 I love the new paint color 🙂 Your Swarovski crystal Christmas tree is such a great idea…and what a great tradition! Plus all of the vintage details add so much charm. It all feels very cozy and Christmas-y. I am really fascinated about the vintage porch! Reading your post, I wanna make one for myself immediately. Thanks for sharing and inspiring! Please keep it going on! 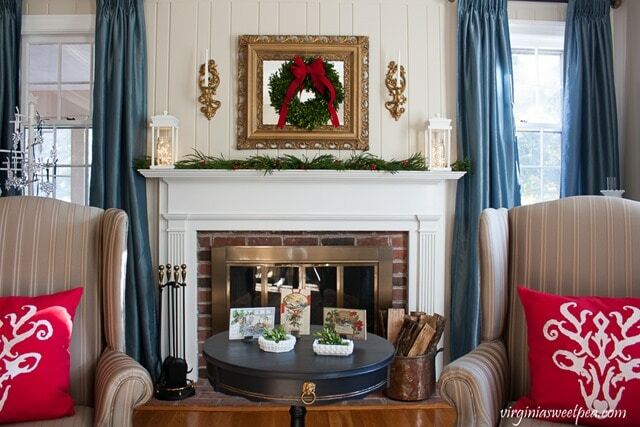 I absolutely love your mantle and the vintage cottage charm it has! Your paint colors look beautiful and the White Dive trim reall makes the Clay Beige pop! Your home looks so comfy and inviting. I love all the pops of red! Thanks for sharing your charming vintage inspired Christmas decor. 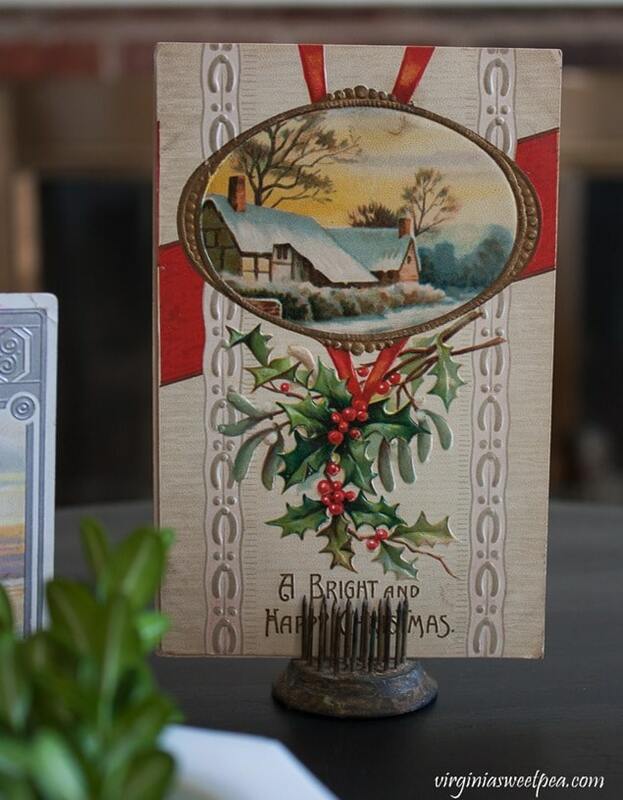 I particularly like the vintage cards displayed in floral frogs and your red and white reindeer pillows. Your room looks so pretty Paula. I love all the vintage touches. And the paint looks great! I love the clay beige and white dove together. So fresh! 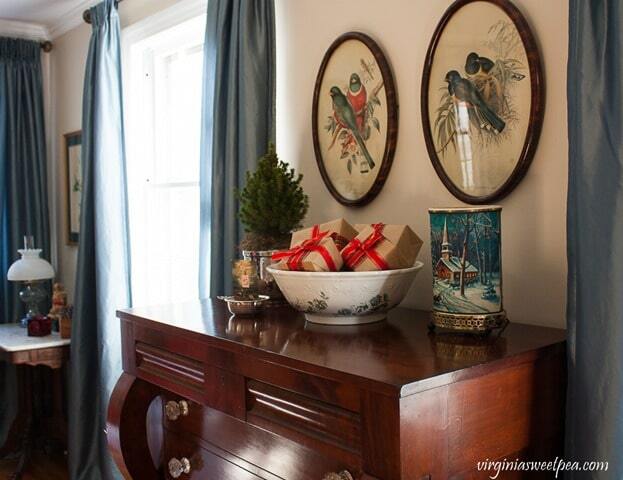 Love your Xmas home.It looks beautiful and I love all your vintage touches.Very charming! Your house reminds me of all the things I loved about me childhood. Great tour. Pinned! Thanks for sharing at our link party! 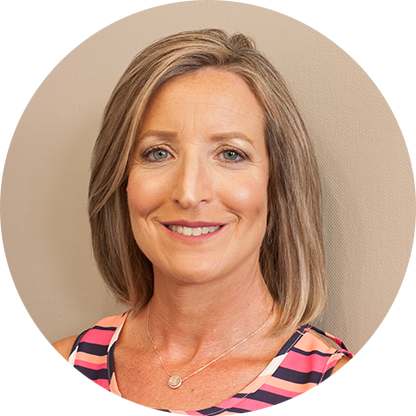 Your home is so full of charm Paula. I love those blue curtains they look so nice with all those red accents. And all that beautiful furniture that has stories to tell. Your home is so beautiful. 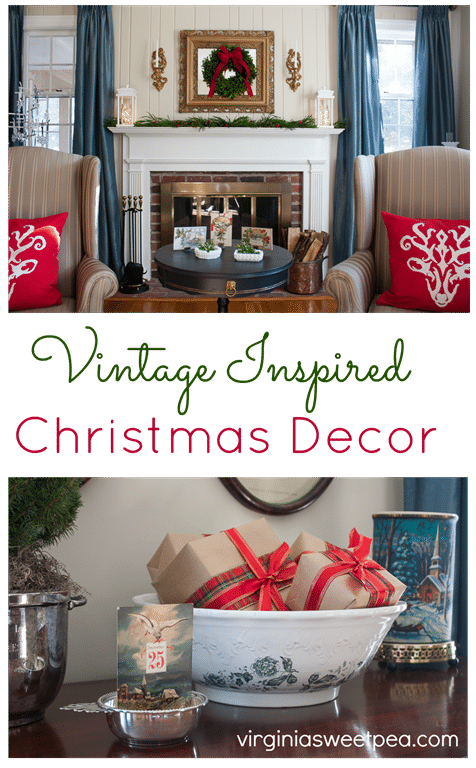 I love the blues and the vintage Christmas items. 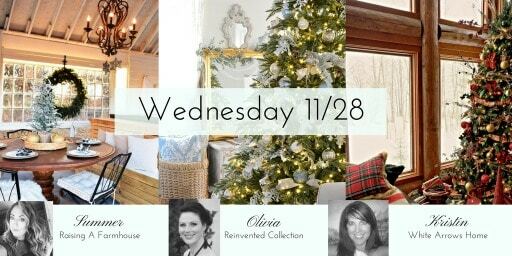 I absolutely adore your Christmas home tour! 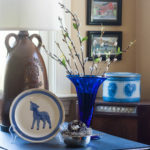 You’ve used so many meaningful pieces all throughout your home and things with stories and history. It doesn’t get any better than that! Flower frogs were a new discovery for me this past spring. I’d never heard of them before but I do have a couple of glass ones Larissa found and gifted to me. Your postcards are incredible! They sure don’t make them like they used to which makes the older ones such a wonderful treasure. I have just one that I found on eBay but I’m hoping to gather a few more in time. Thank you for joining It’s A Wonderful House. I look forward to seeing more of your home this year. 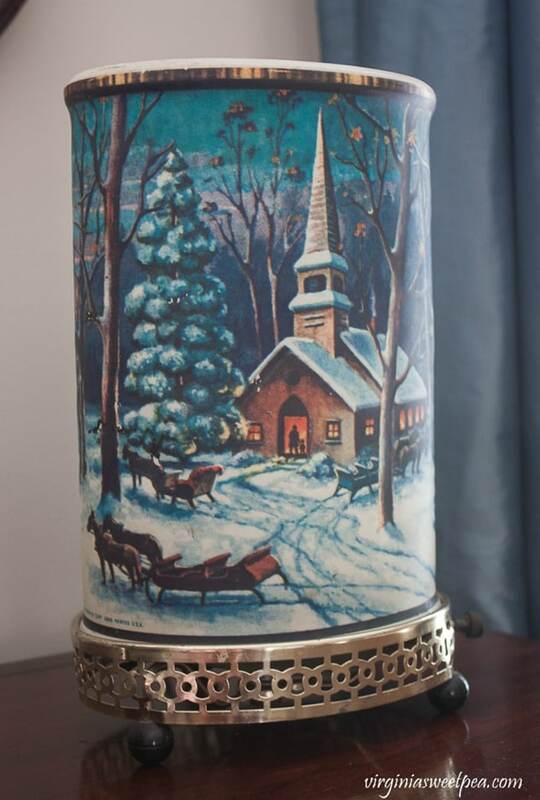 Be still my vintage Christmas loving heart! I am so glad to have found you via the home tour! I will be subscribing to your blog. 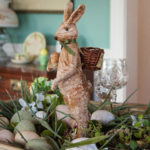 Your home is charming! We love so many similar things! 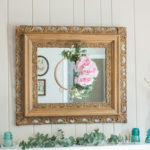 I love the heart you have put into your decor. 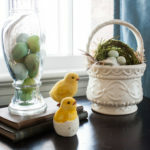 I am not sure if you saw my tour but I also incorporate family vintage treasures. 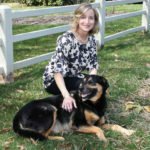 I can’t wait to see more of your home and get to know you better!